While in Istanbul I caught up with a travel blogger I met in Sumatra. I was on a bus from Lake Toba to Bukittinggi, and as the bus was leaving the ticket man pointed to me and said “you two both the same, sit next to him”. It turned out that my new found seat mate writes one of the biggest travel blogs in Turkey and was on an epic round the world trip, and he had plenty of interesting tales to tell over the course of the 16 hour bus ride. I said when I eventually get to Istanbul I will look him up. 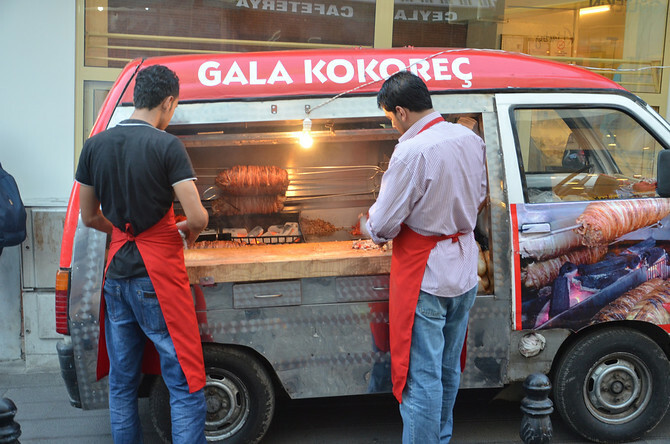 Basar gave me a little tour of the Galata neighbourhood before taking me on a highlights of Turkish food tour. I really can’t recall the last time I ate so much. We started off with kokoreç (think Haggis in a bun, which is not as disgusting as it sounds), followed by some mussels. 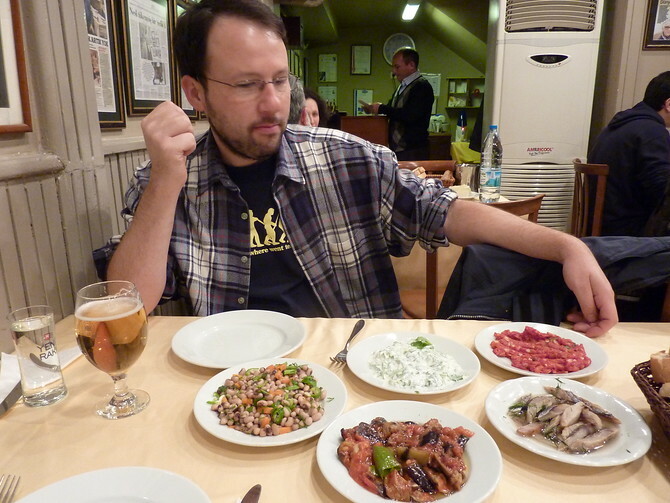 Next was Meze, a popular meal of the Middle East, sort of like tapas. Bas,ar (who I suspect might be my long lost Turkish grand mother) kept ordering plates until I couldn’t fit any more. Pleas to stop were fell on deaf ears, as piles of delicious food kept arriving. I like to abide the rule that there is always room for desert, but I was questioning my ability to fit anything else in after this. I carried on, and we finished the night with dondurma, the sticky ice cream of Turkey. The place we went serves extra sticky dondurma, which is eaten with a knife and fork. I liked it as well. I bet you people in your group would have tried and enjoyed it if they weren’t told what it was. Absolutely! Starting with the excellent Turkish breakfast, which comes with a basket of bread. There was 2 baskets of bread next to the meze as well, which was more than we needed. I had a similar experience in Turkey during a business dinner in Izmir. The plates of food kept coming and myself and my colleagues kept trying to finish them hoping not to offend our hosts. Eventually when we just couldn’t anymore I asked how many more courses there were and our host said that as long as we kept finishing the plate in front of us another would come. Needless to say, the next plate was left half eaten and the delicious experience came to an end.